Monday marked the start of first-round action and the conclusion of the qualifying tournament at the 2011 Atlanta Tennis Championships. The featured match of the evening was former world No. 4 American James Blake against the 22-year-old Latvian Ernests Gulbis. The veteran from the USA was down 4-0 in the second set tiebreak, after dropping the first set, but reeled off the next seven out of eight points to force the third set. With Blake up a break, rain forced an hour and 18 minute rain delay. After the players retook the court Blake won the next three games to take the match 5-7, 7-6 (5), 6-2. During the match, he saved 17 of 20 break points, including all nine in the third set. The biggest battle of the day came on court one, with American Ryan Sweeting facing off against eighth-seeded Indian Somdev Devvarman. The two stars split the first two sets to force a third that was full of momentum swings. Devvarman served for the match at 5-3 and was up 40-0, but the heavy-hitting American fought back to break. However, the crafty two-time NCAA champion Devvarman broke back in very next game to take the match 6-4, 3-6, 6-4 in two hours and 23 minutes. Atlanta native Donald Young dropped the first set 6-0 to the veteran American Michael Russell and called the trainer down 2-0 in the second to stop play briefly. A tiny glimmer of hope shone through for Young, winning the next three games, but the 13-year veteran of the ATP World Tour broke back and closed out the match 6-0, 6-3. In the only upset of a seeded player in the main draw on the first day, Gilles Muller of Luxembourg defeated seventh-seeded American Alex Bogomolov, Jr. 6-3, 7-6 (6). The 6’4" Muller had 17 aces against Bogomolov, who is at a career-high ranking of No. 63. To round out the action in the first round, Japan’s Tatsuma Ito recorded his first career win in an ATP Tour-level event over German Michael Berrer. 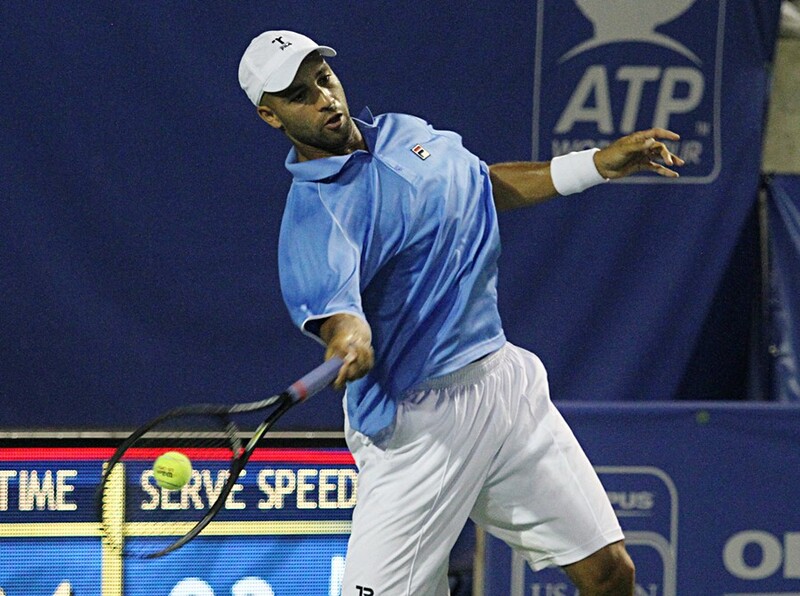 In the final round of qualifying, Americans Rajeev Ram and Phillip Simmonds recorded upsets over Aussie Matthew Ebden and American Tim Smyczek, respectively, to book their spots in the main draw. Also advancing are Marinko Matosevic, who beat American Denis Kudla in a third-set tiebreaker, and Japan’s Yuichi Sugita, who stopped Olivier Sajous of Haiti from reaching his first main draw of an ATP Tour-level event. These four qualifiers are now in action in the main draw on day two. Sugita will play American rising star Ryan Harrison, Matosevic will take on sixth-seeded Russian Igor Kunitsyn, Ram will face up-and-coming Bulgarian Grigor Dimitrov, and in the first match on stadium court, Simmonds will try to upset former world No. 1 Lleyton Hewitt. The other singles matches tomorrow feature Yen-Hsun Lu vs. Matthias Bachinger, Richard Berankis vs. Nicholas Mahut, and the featured evening match on stadium court, Tommy Haas vs. American Robby Ginepri in a battle of tour veterans. Following this match, the doubles play kicks off with American duo James Blake and John Isner taking on the second-seeded team of doubles specialists, Marcelo Melo and Jamie Murray.